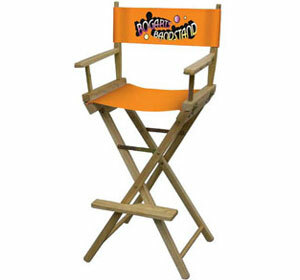 Buy personalized director's chairs with your printed logo for a trade show or special event. These original director's chairs are available in two heights. The heavy-duty 14oz. cotton canvas seats and backs support up to 225lbs. An environmentally friendly product made from rubberwood trees that are at the end of their rubber producing cycle. If you have any questions about choosing the right custom director's chair for your exhibit please call us toll free at 1-855-536-3385 or contact us by email. 34.25″ tall. Includes printing of your logo. Weighs 11lbs. 46.5″ tall. Includes printing of your logo. Weighs 14lbs. 34.25″ tall. Unimprinted, available in nine fabric colors. Weighs 11lbs. 46.5″ tall. Unimprinted, available in nine fabric colors. Weighs 14lbs.